The Xiaomi Mi Sphere has emerged as a dark horse 360 camera that has surprising photo AND video quality (it appears to have the best of both compared to consumer 360 cameras). However, one issue is that it has limited compatibility with smartphones, requiring a Snapdragon 625 or better processor in order to export the full video resolution. Xiaomi’s app has limited iPhone exports to 2304 x 1152 — less than half of the full resolution. One solution to get the full resolution out of the Xiaomi is to use a third party software to stitch the videos, and Muvee Stitcher is probably the most affordable such software. 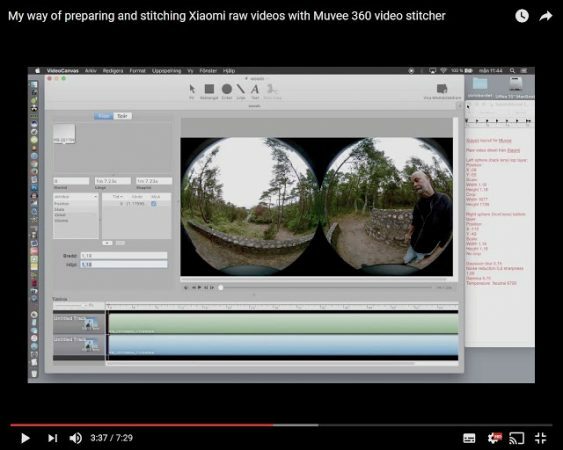 Ulf Brusquini shared this tutorial for stitching Xiaomi Mi Sphere videos in full resolution using Muvee Stitcher for Mac. Be sure to check out Ulf’s YouTube channel! Besides using a third party stitcher, another solution is to buy a fully compatible smartphone just for rendering purposes. Previously it seemed that you would need a Samsung S7, which can be bought used on eBay with cosmetic damage for under $250. However, thanks to other Xiaomi users, we’ve found out that even a Snapdragon 625 would work, so I’m going to try out a phone that may be able to export Xiaomi at full resolution, that costs as little as $160 brand new.